The direction of movement of the mold is ensured by the guide. At the same time, the guide device also plays a role in positioning the mold gap uniformity and precise mold movement. Guides are commonly used guides composed of guides and guides (including sliding and rolling fit); guide guides (including general guide and self-lubricating guide couples), mainly for large die, slider and guide rail components Slanted core guide; die feeding guide plate. The guiding device of the direction of movement of the mold, because it plays a role of precision guidance and precision positioning, so it requires high precision and good guide stiffness. The injection molding die, die-casting demolishing structure and mechanism design, die unloading structure and mechanism design, as well as core-pulling mechanism design, is also the key technology of the overall design of the die. Injection molds for plastics and mold release molds are usually designed to have a draft angle on the molding surface, and at the same time, a top piece mechanism is provided on the fixed mold. The parts of the top piece have been standardized. The unloading of the die is usually designed on the die to design the leakage hole leakage material, and to design the striking mechanism or design gas on the punch. The feeding of the die and the design of the safety mechanism, the feeding and pouring system design of the plastic injection mold and the die casting mold and the design of the cooling system are the key technologies for the overall mold design. Some of the parts and components used have been formed into standard products so that users can use them at design time. Supporting and fastening the form work is the main supporting part of the mold. The mold frame is divided into two parts: the mold base (or movable mold) and the lower mold base (or fixed mold). The punch mold and its accessories and the concave mold and its accessories are fixed on the mold base, and the pressure mold and the plastic injection mold are fixed. The die part is also provided with a capping mechanism. The mold base is also a supporting member of the feeding mechanism and the core pulling mechanism. In addition, the punch support plate in the die, the support plate of the fixed plate and the discharge plate, the pad in the plastic injection mold, the support plate, and the fixed plate of the top bar are all standard support parts with certain functions. The fixing and connection of the mold are divided into two kinds: rigid and elastic. Bolts and positioning pins are commonly used for rigid fixing and connection methods. Among them, the pressure material and the stripper plate are elastically connected. 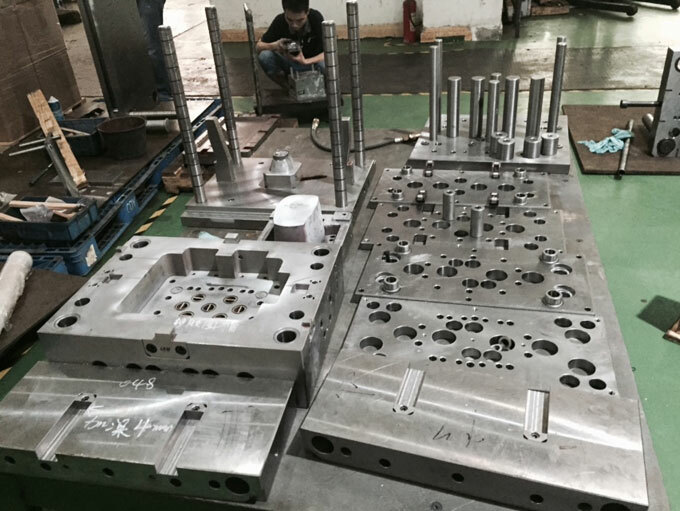 The connection between the upper mold base (and movable mold) and the lower mold base (or fixed mold) is guided by guide columns and guide bushes, etc., so that the mold clamping motion is performed and connected in time to complete the forming of the part. The basic conditions of the above mold design: mold driving, driving force and movement; mold surface structure and design; overall mold structure and design, is an overview of the overall structural design elements of the mold, is a summary of the key technologies of mold design and design methods It is also the basic principle or method of mold construction and work.